Epson has sent us their WorkForce WF-7520 wide-format all-in-one wide format inkjet printer to review. This printer will be on the shelf some time in January/February 2013. Billed as the world’s fastest inkjet printer that is also capable of printing on 13″x19″ paper without breaking a sweat. Along with its speed and wide format paper capability, it is an all-in-one design which comes with a large flatbed scanner surface, wireless and Ethernet, and many, many more features. The WF-7520 is the printer for small office with growing demands, but at a much cheaper price tag and cost of supplies than an equivalent color laser. 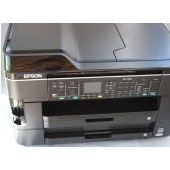 We have reviewed a few other Epson printers in the past, such as the WF-840, and WF-635, so lets get started as this printer has a quite a list of features to cover. Save 50% of your paper supply with automatic, two-sided printing (user must specify they want to the print job to print on both sides). Warning!!!! The printer seems good but the Epson Software that goes with it is a complete and utter dog. Error messages failure to copy file warnings and restart your computer messages all over the place. Came close to getting it all to work but four hours later and two massive uninstalls and retrys and now nothing is working. iIt’s going onto an XP machine with a decent Telstra WIFI setup. Epson should be ashamed of their crappy software. The manual that came with it needs a magnifier as well and its basic info only. My advice is do not buy this machine. It will likely not install cleanly to your WIFI and it will cost you days of lost time trying to get the software to work properly. No wonder they were being run out cheap at Office Works. I have the same issue, wifi scan to pc is a disgrace. Will not work properly.